I am feeling so grateful and overwhelmed by all of kind words from teachers following me on TPT. I absolutely love creating materials to use with my students and I am just so amazed that other people want to use them too! 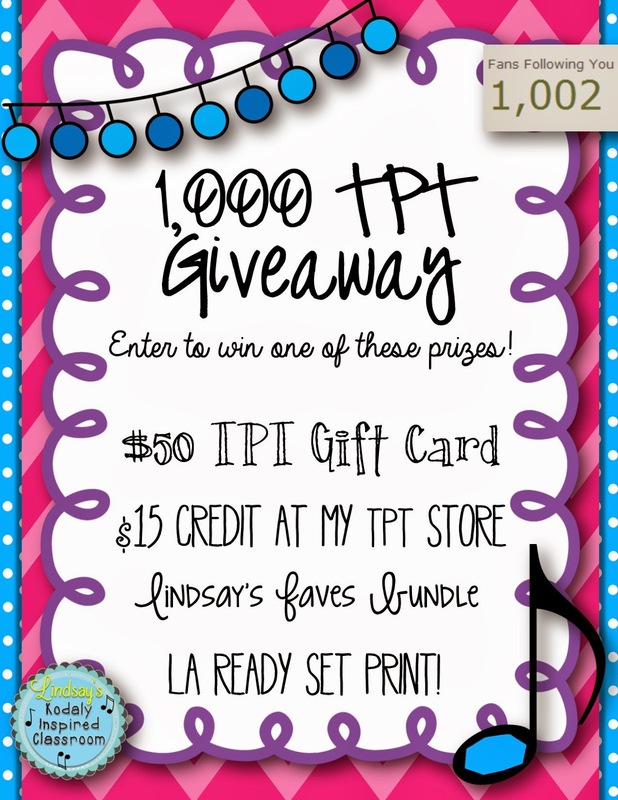 In honor of reaching 1,000 Followers on TPT, I want to celebrate with a giveaway! 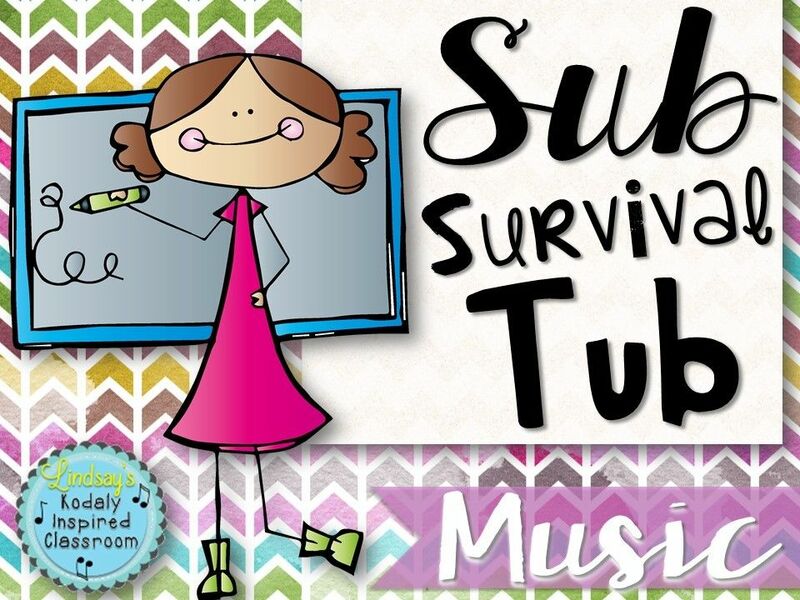 3) "Lindsay's Faves" - a bundle of resources so generously donated by Aileen Miracle, Amy Abbott, Brittany De Laruelle @ Making Music Memories, Chrystine Tinney @ Tweet Music, Malinda Phillips, and Sara Bibee as well as my "La Ready Set Print!" I'm so excited about your giveaway! (Congrats on getting to 1,000! I'm currently at 8 followers....) I love your materials and am so glad I found quality, helpful resources to assist me in lesson planning. My kids thank you! I really like all the rhythm activities you have. When I need something for a particular skill, (this week we're working on syncopa)---I just pull out your ready made files! Great stuff! I love all of your products, but my new favorite is your print and go sets! Your worksheets are great! This is such an exciting giveaway! I love all of your products - and so do my students! Thank you for providing such a wonderful resource!! Thanks for offering a cool contest! 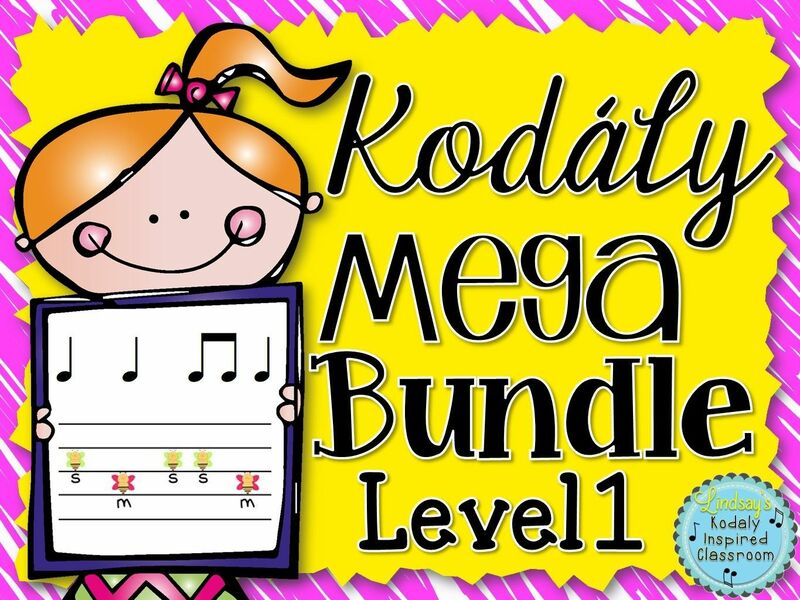 My favorite purchase from your store is the Music Word Wall Bundle! Congratulations on your milestone! 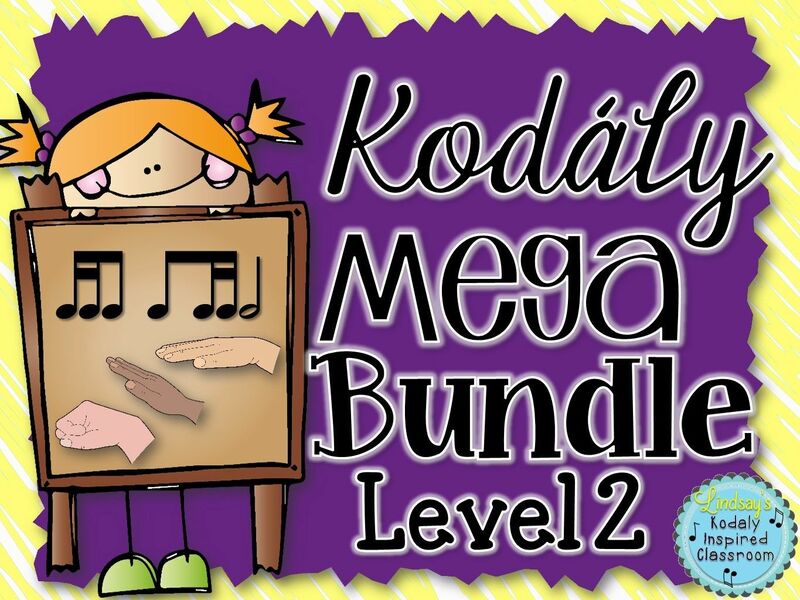 Thank you for your contribution to music classrooms everywhere. I love your products and my kids love them, too. Thanks also for the great giveaway contest! Congrats on 1000+ followers! I'm so excited for the giveaway! I love you melodic concept bundles! So excited about the giveaway! Congratulations on reaching over 1000 followers, I'm sure it will be a matter of time that you double that number. Keep up the wonderful work you do. Thank you!! My favorite (and my student's favorite) are your Post Office files! The kids get so into it! Very exciting giveaway. Congrats and thanks so much! What fantastic resources!! 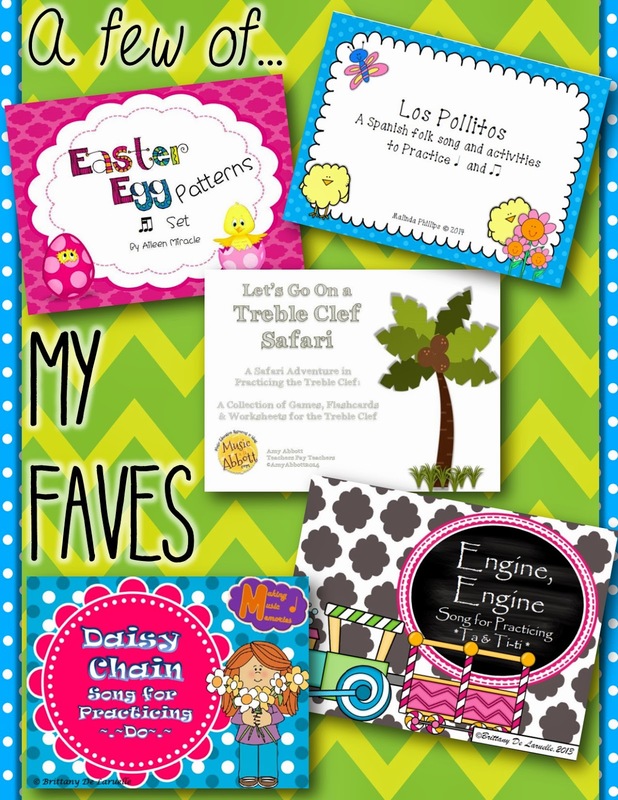 I'm just learning about TPT and I cannot believe what incredible stuff is available!! I have purchased several of your items, but my kids LOVE your Steal the Bacon set!!! I also love your new treble clef worksheets! THANK YOU for such great products! Love your resources! I second the idea about more things for pre-k/transitional kindergarten...I'm not ready to teach them ta/titi yet, so I struggle finding things that are fun and educational for them in the prep stage. What a fun giveaway! I have used so many ideas from your blog! One of my favorite items I've purchased from you is the seasonal sets. I've been telling anyone who will listen about TPT!!! I loved your "getting started on TpT." I just sold my first product yesterday and I have 4 followers. Hoping this is a fun journey! Thanks for continuing to make great resources. I use many of them! Thank you so much for the Frenzy and the follow up giveaway! I also appreciate all of the advice you have given me! I'm so glad that we have found each other! :) Thank you for following! Wow congratulations! And would love to win this giveaway! 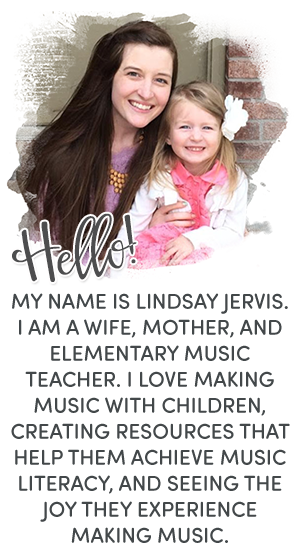 I love your worksheet ideas and your whole blog! I would love to see how you do it all! Congratulations on 1000 followers! I'm new to your blog, but I love your resources!! Congratulations! I would love to see some space themed products. Also anything with a music and the brain theme would be awesome! Congrats on your 1000 followers! I've had good success with your resources in my classroom and would love to win one of your giveaways. I would like to see more HIGH 'do" files in any fashion…prepare, present, practice. Congrats! I really loved the St. Patrick's Day Songs and Activities. I had even my most self-conscious 6th grade class singing at the top of their lungs with the O' Leary ball bouncing game. They also LOVED the Steal the Bacon game. :) Thanks for all your wonderful resources. As a first year elementary teacher and a first year mom, they have been invaluable! Congratulations on your achievements! I love the Steal the Bacon/Gold/Banana sets. The kids love it. They have also loved the Pick a Pumpkin Pie and Sled Races. I have all those games and my kiddies love, love, love them! Thanks so much! I love your "steal the bacon" activities and Cinderella at the ball! I LOVE your Songs and Activities for Valentine's Day!!! The MANY ideas in the files are useful YEAR-ROUND and not limited to Valentine's Day! 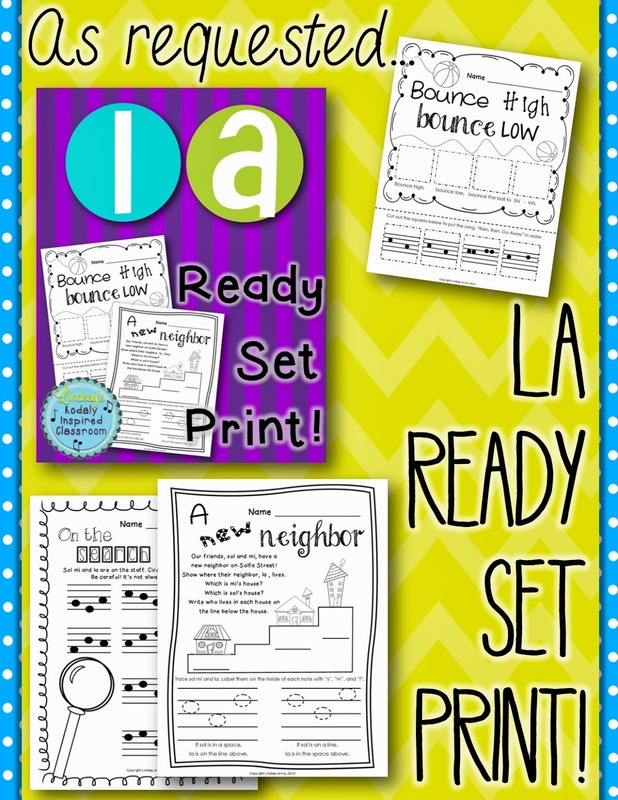 GREAT files for primary AND intermediate students! You do a wonderful job of presenting the concepts and giving students lots of practice. Thank you! CONGRATULATIONS on your 1,000 PLUS followers!!! As I have said many times, I love all your work! My favorites lately are the new worksheets you have been coming out with. I like having fun worksheets to work on with my students and it is a bonus when I don't have to make them myself! Congratulations on 1000 followers! I'm excited about your giveaway! What a great giveaway! I love your products and use them quite frequently :-) Congrats on the 1,000 followers!! !